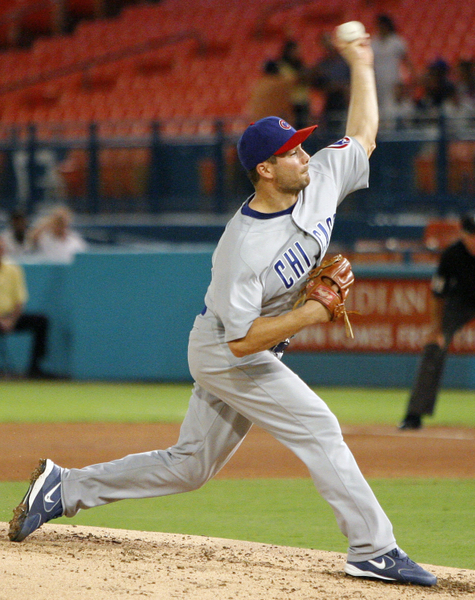 At the age of 32, Ted Lilly doesn’t have the same giddy-up on his fastball as he used to. In fact, his average fastball was just about 88 mph last year, which ranked near the bottom of the league for starters. Despite this, Lilly continued to throw a lot of high fastballs and he paid the price, giving up 32 home runs, nearly a home run and a half per game. This should be no surprise throwing soft fastballs up in the zone causes many souvenirs for fans. The question, then, is why Lilly would continue to work upstairs. The answer lies in Lilly’s curveball, which is one of the best in the game. Lilly throws a lollipop curve that, at 70 mph, doesn’t look like it ever is going to get to the plate. Combine that speed differential with almost 10 inches of vertical drop and you have a pitch that needs to be thrown relatively high in the air or it is going to bounce well before it reaches home plate. The problem is Lilly’s fastball doesn’t require nearly as much height, so the result is his curveball looks much different than his fastball to a hitter. Here is a side view of the average of all Lilly’s fastballs and curveballs put on the same plot. The back tip of home plate is at a horizontal distance of 55 feet, so 0 feet is near the rubber but not quite on it (because pitchers release the ball a few feet in front of the rubber). The two tick marks on the fastball and the curveball represent how far the ball has traveled in .075 seconds, which is when Bob Adair found is the time the batter has to decide whether to begin to swing. The line drawn between the curveball and the fastball represents the maximum distance between the two pitches. As you can see, Lilly’s average curveball looks nothing like his average fastball, and major league hitters definitely can distinguish the two. When the fastball and curveball line up closely during the first half of the flight it is called pitching on the same plane. When they differ, a “hump” is produced, like what you see here from Lilly. Because curveballs rely so much on deception, this is a big problem for Lilly. Lilly needs good production from his bread-and-butter pitch, so he needs a way to make these two pitches look more alike. He can’t lower his curveball’s height because that would produce a ball that bounced well before it got to home plate. The solution is to throw his fastball higher. Lilly knows he can’t work upstairs all the time, but he chooses to throw high heat some of the time to hide his more effective curve. In particular, Lilly will follow up a high fastball with a curveball so that the height is fresh in a hitter’s mind. Of course, hitters don’t have the luxury of seeing the side view; they have to view the pitch mostly head-on. Here is a simple animation to give you an idea of what a hitter is looking at. Actually, this is from the catcher’s perspective, so the coordinate system is identical to what we have been using and shifting to the hitter’s head doesn’t change the perspective much. Let’s start by looking at Lilly’s average fastball and curveball. This is slowed down by a factor of 10, so you can really see what is going on. Notice how the fastball begins to lose altitude right from the start, but the curveball must first move up before it can fall. Once it starts to fall, it drops very rapidly and ends up below the fastball. This is the hump I was referring to in the side view. Look how dissimilar these two pitches appear. Now here is a random example of a high fastball followed by a curveball from Lilly. The curveball still needs to rise before it can fall and the fastball still is falling from the beginning, but the higher launch angle means these two pitches appear similar for a much longer time. The fastball now ends up much higher than before, but now, Lilly hopes, the hitter will be confused by the curveball and swing over the top. This logic makes perfect sense. Lilly is choosing to make his fastball a little less effective to try to make his curveball more effective. John Walsh has already studied the effects of throwing high fastballs in the link above, showing that, overall, Lilly isn’t going to be punished too much by throwing a lot of high fastballs. The real question is how much Lilly is gaining with his curveball when it is preceded by a high fastball. The first thing we need to do is to define exactly what we mean by a high fastball. I am going to define it for this study as any fastball that crosses the front of home plate 33 inches off the ground or higher. I picked this number because at that height an average fastball and an average curveball would produce no hump. I don’t care about the horizontal location of the ball; that doesn’t impact the hump of a curveball that might follow. Next, we need to determine a metric for success. We will choose a slightly modified version of runs100. Runs100 is a metric developed by John Walsh to measure how many runs a pitcher saved with a given type of pitch in 100 pitches. Negative numbers here are good for the pitcher so if I said that Barry Zito’s runs100 for his curveball was -2.0 that means that Zito saved two runs over 100 curveballs. The only modification we need to make is to normalize this quantity by the count. Curveballs are much more successful when the hitter has two strikes on him and trying to protect the plate. Since we are interested in curveballs following high fastballs, this situation tends to occur later in the count. Lastly, we count only curveballs after high fastballs to the same batter. So if a pitcher strikes out a hitter with a high fastball and then starts the next hitter with a curveball, that doesn’t count. Major league pitchers throw a curveball about eight percent of the time and about 15 percent of the time a curveball is preceded by a high fastball. When a pitcher does this, he decreases (remember lower is better) his runs100 by .62 which is a very large difference. It isn’t a perfect analogy. but consider the difference between a pitcher with a 4.00 and a 4.62 ERA. Getting back to Lilly, he threw a high fastball before a curveball 28 percent of the time—almost double league average. Interestingly, his gains were insignificant compared to his curveballs not preceded by a fastball. At first I thought this was because Lilly’s hump was so pronounced that a marginally high fastball wasn’t enough and he would require even higher fastballs to show results. So I ramped up my high fastball definition to 40 inches, which is at the very top of the strike zone for most hitters. Lilly still throws a really high fastball before a curve 10 percent of the time but again his results were flat. It is possible that this is just a blip and if I looked at other years Lilly would show improvement with curveballs following high fastballs. Or, it is possible that Lilly is throwing enough high fastballs that that height is always in hitters’ minds, so all his curveballs are befitting. Yankee prospect Phil Hughes is another interesting pitcher to track this with because of his large hump on his curveball. In fact, Hughes’ hump is the largest in the league by more than two inches. You would expect that Hughes would be throwing some high fastballs to help with the deception, but he didn’t once throw a high fastball followed by a curveball all year. In Hughes’ defense, his year was less than 40 innings but still you would have expected at least some high fastball/curveball sequences. Hughes mowed down minor league hitters at every level, but he is still a very young pitcher. He also is almost exclusively a two-pitch pitcher (fastball/curveball) so he needs both pitches working to be successful. His curveball last year was over two runs100 worse than a league average curveball. surprising considering how much scouts love the pitch and how much movement he gets with it. It seems pretty clear that Hughes just doesn’t have the necessary deception yet and big league hitters are recognizing his curve and either laying off the pitch or hitting it hard. It is very possible that Hughes’ great movement was enough to fool minor league hitters and up until this point he never needed to properly disguise the pitch. With the Yankees’ rotation looking full after their offseason spending spree, it seems likely Hughes will start the year in Triple-A. He is likely to do well there as he has already shown he can get hitters out at that level, but without some tweaks, I would be very surprised if he had a lot of success at the major league level. Obviously, he is a very young pitcher and has a lot of time to make the proper changes, but it can be hard to work on something at a level where you don’t really need to use it to be successful. While this study was done with major league players, it is likely that the sequence of high fastball then curveball is a successful one at lower levels as well. Because hitters are less sophisticated the lower you go, the effect is probably smaller but still present. Sadly, PITCHf/x hasn’t made its way to minor league or college stadiums yet, so pitchers might not be aware of exactly how big a hump their curveball creates. One way of finding out is through video, but make sure you have a decent enough sample before rushing to a judgment. You can also have a coach or teammate watch you while you pitch, preferably from the side. to look for the hump. Be a bit careful of this, too, because the eye can play tricks on people. Fortunately, there is another way to guesstimate if your curveball’s hump is noticeable. First, is your arm angle. Pitchers who throw over the top tend to have a lot of backspin on their fastballs, a lot of front spin on their curveballs and little side spin on either. This produces the classic 12 to 6 curve and can lead to a hump. Second, is the speed of your pitches. If your curveball is significantly slower than your fastball, it will be in the air for a lot longer and will likely need to be thrown at a different height. Third, is the movement of the pitches. If your fastball has a lot of “rise” to it and your curveball has a lot of downward movement, there likely is a hump between the two. If two of these three things describe you, you likely have a somewhat significant hump between your fastball and curveball. If this is the case, consider mixing in some high fastball/curveball sequences. It’s important to remember that the whole point of this is to get the hitter seeing at a different level. If the hitter you are facing hacks at anything, don’t bother with the fastball; just throw him the curve and he will likely chase. Use this only against polished hitters who see the ball well. Also, if you intended to throw a high fastball but it ended up lower than you wanted you aren’t necessarily set up for the curveball. The hitter has no idea what you were actually planning, so if the ball ended up in a different location you have to use the result of the pitch, not the intention, to figure out what to throw next. Conversely, if you meant to throw a fastball at the knees but it ended up letter high, now might be an excellent time for a curveball. This is especially the case if the hitter swung and missed or foul-tipped it. He is probably cursing to himself that he missed that last pitch and trying to make sure he doesn’t miss it again. Now when you throw the curve he will see high fastball and likely swing over it. Lastly, don’t overdo it. Major league pitchers use this sequence about 15 percent of the time and 25-35 percent if their hump is larger. While this is probably an effective sequence for deceiving the hitter, if you use it too regularly you will lose all the deception you worked so hard to achieve.